Budget-minded boat owners looking for hard-to-find parts for a refit or restoration project have a new online resource. Created by Doug McQuilken, who is restoring a vintage wooden catboat, boatusedpartsearch.com (aka BUPS) has helped thousands of boat owners locate parts. 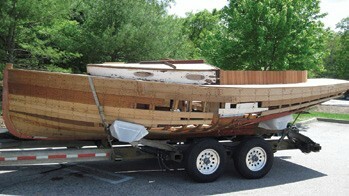 This catboat restoration project inspired Doug McQuilken to launch boatusedpartsearch.com. BUPS maintains active inventory from hundreds of websites, and sends daily email (text in the future) alerts for “fresh” listings meeting user-defined criteria. Whether you’re a buyer or seller, seeking set of sail rings for a Sunfish or a spinnaker for a Swan, try boatusedpartsearch.com.